They’re back! The creepy crawlers of Centipede™ have given way to the ultimate generation of “nasties” in Millipede, the all-new video adventure fantasy from Atari. You’re deep in a forest glade… you’ve got to defend yourself from hordes of larger-than-life insects. The bugs keep coming… all kinds… hundreds of them! The onslaught continues. The intensity increases. Armed only with bow and arrows, you – as the Archer – must fire through a field of wild mushrooms to hit the Millipede who steadily advances toward you. Single head shoot out from the sides. Spiders, earwigs and beetles enter to wreak their own special havoc. Suddenly the screen is filled with a wave of bombing bees, dragonflies and mosquitos. Your only chance is to explode on of your DDT bombs. You’ve stopped them… temporarily. Millipede is a high-energy skill challenge all the way. Are you ready to battle the bugs? Remember you risk the sting of defeat… but to escape the challenge is unthinkable. Arm yourself. Ask for Millipede where you plain coin video games. 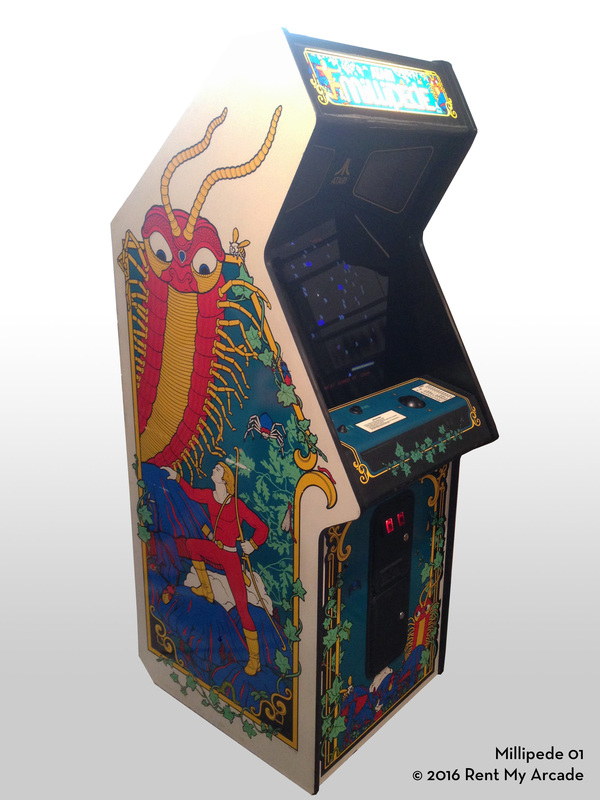 Includes both Millipede and Centipede games in one cabinet. H: 71.75", W: 25.25", D: 34"